For all courses in Materials Management, Production, Inventory Control, and Logistics taught in business and industrial technology departments of community colleges, four-year colleges, and universities. Helps readers understand all elements of production planning and control, and how they fit together. 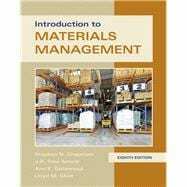 Introduction to Materials Managementcovers all the essentials of modern supply chain management, manufacturing planning and control systems, purchasing, and physical distribution. Clearly written and exceptionally user-friendly, it’s content, examples, questions, and problems lead students step-by-step to mastery. Widely adopted by colleges and universities worldwide, this is the only APICS-listed reference text for the Basics of Supply Chain Management (BSCM) CPIM certification examination. Stephen N. Chapman, PhD, CFPIM, is retired from North Carolina State University where he taught and researched in the Operations and Supply Chain program. He also had previous academic appointment at the University of Iowa, Duke University, and the University of North Carolina. Prior to his academic career he held several positions in industry, including materials management positions at Nortel and NSK Bearing Company. He also was a senior consultant with Deloitte Consulting. He continued to consult with several major companies during his academic years. Steve has a BA and MBA from the University of Michigan and a PhD in Operations Management from Michigan State University. He has been active in APICS Certification Committee for many years, including positions with Master Planning of Resources, Strategic Management of Resources (including two terms as Chair), Basics of Supply Chain Management (he was responsible for the development of the module and served as the first Chair) and also served one term as Chair of the CPIM program, responsible for overseeing all five CPIM module committees. In addition to Introduction to Materials Management, he is also author of The Fundamentals of Production Planning and Control, also published by Pearson. Ann K. Gatewood, CFPIM, CIRM, CSCP, has twenty-six years’ experience in consulting, training, instructional design and project management. She is president of Gatewood Associates, and specializes in delivering customized quality consulting, adult education and training materials in the areas of operations and resource management, business processes, team building, strategic planning, change management, supply chain, performance measurement, ERP, people empowerment, and e-business processes. She has successfully implemented multiple ERP systems and business process improvements for numerous organizations in a variety of industries, small companies as well as multi-billion dollar organizations, and authored and delivered many customized courses. Ms. Gatewood’s many years of experience in the supply chain field allow her to provide valuable, skills-based consulting, business process improvement, education and documentation which are geared to user needs and business objectives, utilizing best business practices. In addition, she works with organizations to develop education, training and certification materials, and teaches Train-the-Trainer classes to help companies develop their trainers with effective adult education methods. Ms. Gatewood has been an active member of APICS for twenty-nine years. She has served as Chair of the APICS Certification Committee, Chair of the APICS CPIM and CSCP Programs, and member of the APICS Voice of the Customer Committee, Body of Knowledge Committee and Strategic Direction Committee. She has held several APICS volunteer positions, including chapter president and district staff, and is a frequent speaker at chapter and district meetings, and regional and international conferences.